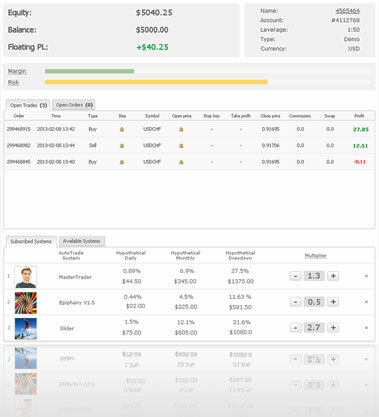 AutoTrade is one of the most advanced copy trading platforms around with a sophisticated and intuitive web interface, completely developed, maintained and operated by Myfxbook. AutoTrade provides you the chance to have the same trades as they who have been successful, making it a perfect option to diversify your forex portfolio. By subscribing to AutoTrade system, the selected trading system will be automatically synced with your connected FXOptimax MT4, allowing every order to be replicated in your trading account. This social trading is very popular, yet easy to use. An in-depth analysis and statistic are displayed for each trader. You can add any trading system which attracts your interest anytime you wish and remove it immediately when you lose your interest. You are still able to trade manually in your AutoTrade connected MT4, furthermore you may also intervene the orders opened by AutoTrade systems if you have your very own thought about the market. If you have not registered at FXOptimax yet, please open a new account here. If you have an account with us, please login to MyFXOptimax and add a new Myfxbook connected MT4. A minimum of $1000 deposit is required. Once your Myfxbook connected FXOptimax MT4 is ready, please complete this form to finalize your registration. Fund your account and start choosing good trading systems to follow.